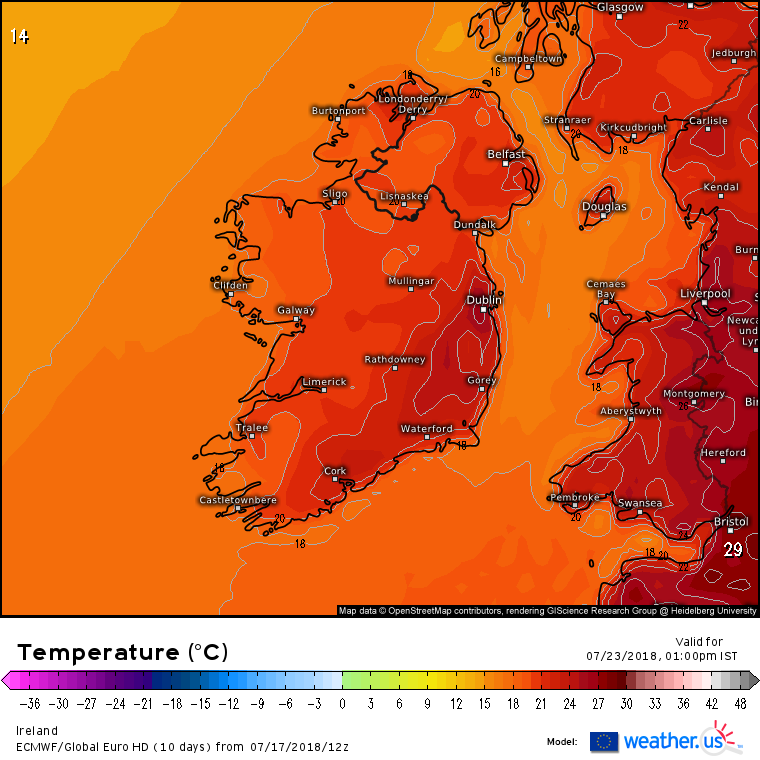 Cooler interlude for now bringing fresher temperatures than of late but not long until we'll find ourselves in double 850hPa temperatures again by the weekend. 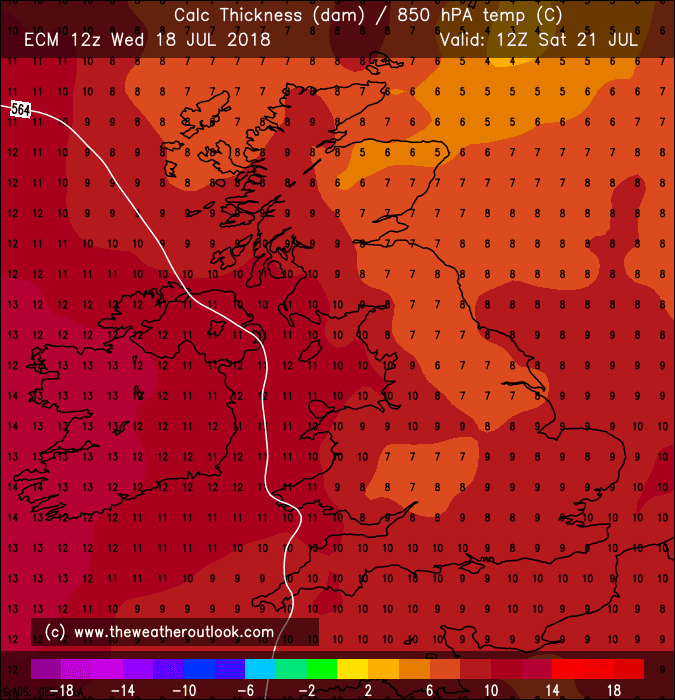 Best chance of a drop of rain this week Thurs evening into Fri according to the ICON and ECM . Not much for some but every drop counts in this dry spell. 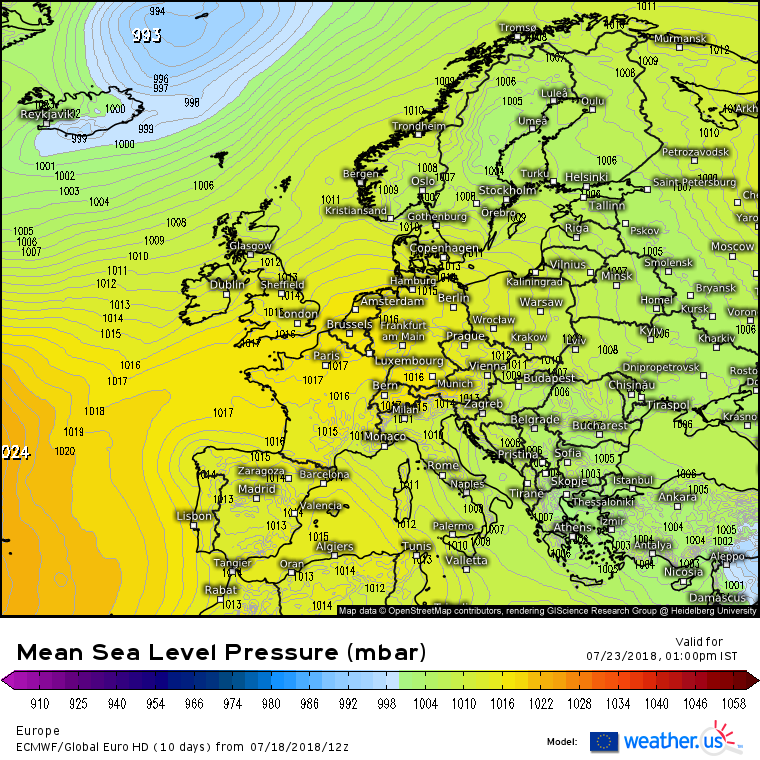 ARPEGE, GFS show it mostly missing the country. 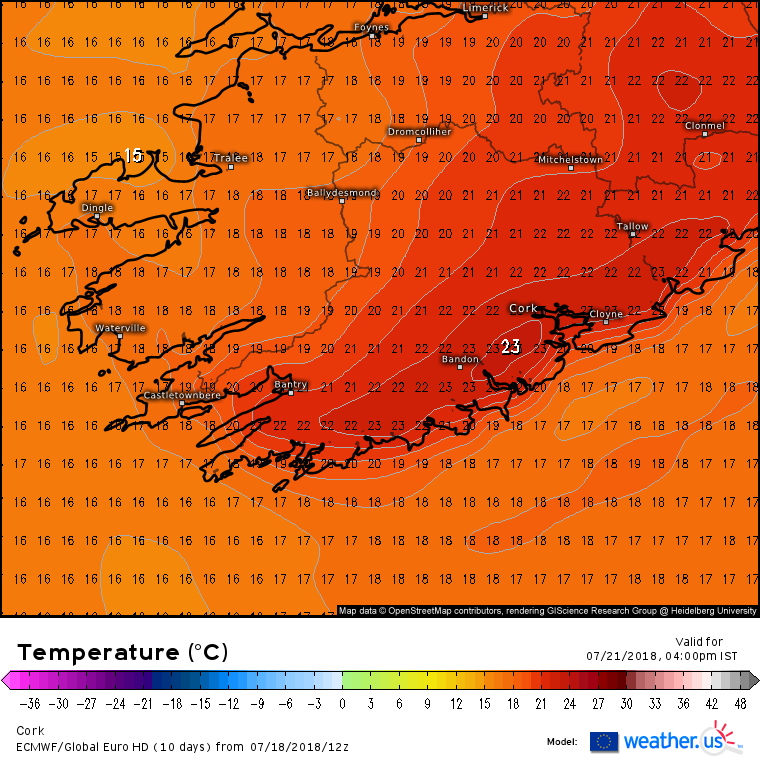 American models not showing much if any rain on Thurs night/ Fri morning. 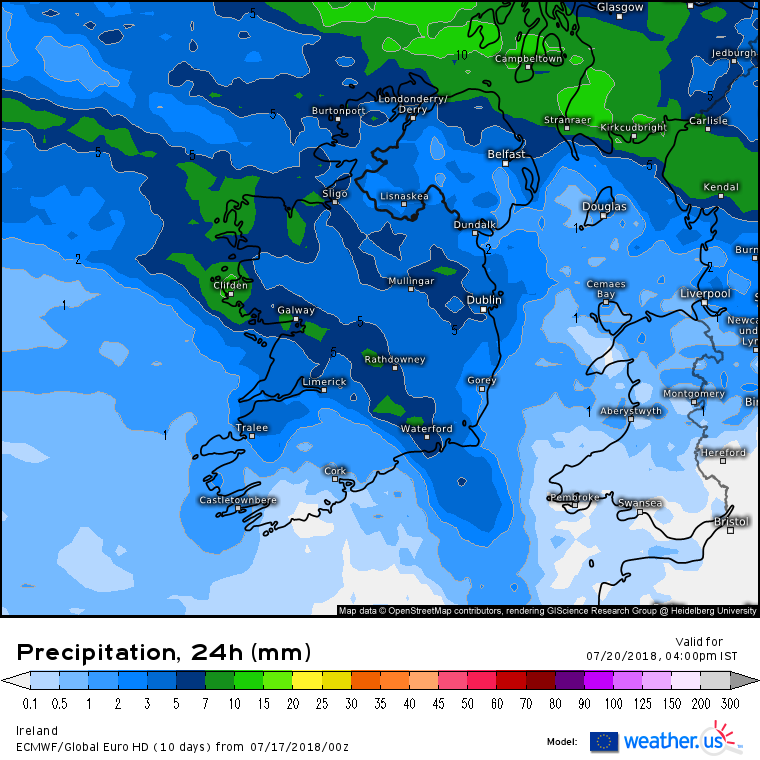 ECM a bit less to what was modelled yesterday, ICON eased off a good bit on totals, ARPEGE showing a decent bit of rain overnight into Fri. Met Eireann's Harmonie showing light rain. Temperatures picking up again the weekend with Sunday and Monday looking like the warmest with the ECM showing 27C reachable. 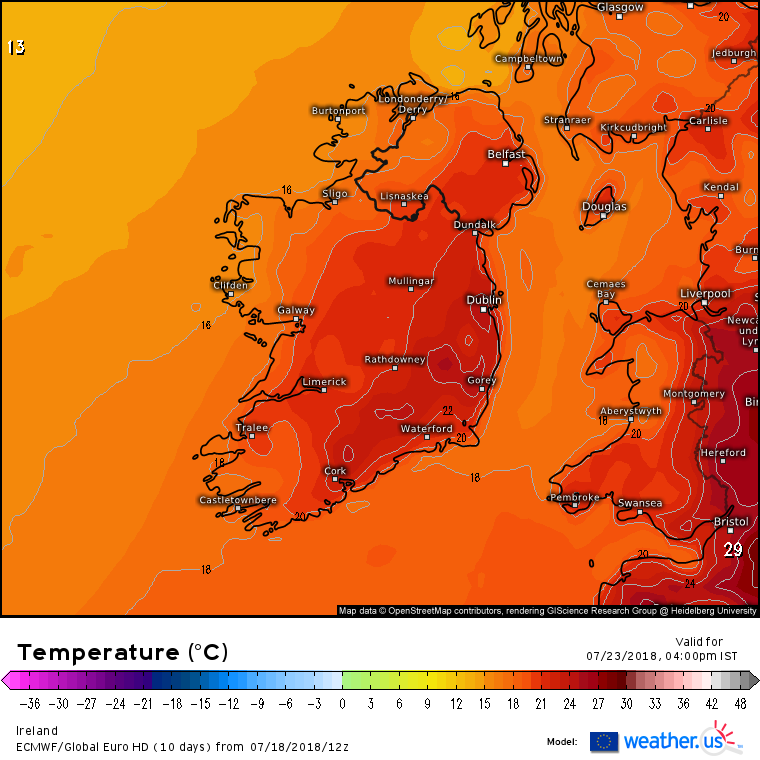 ECM 12z 850hPa temperatures for the coming weekend. 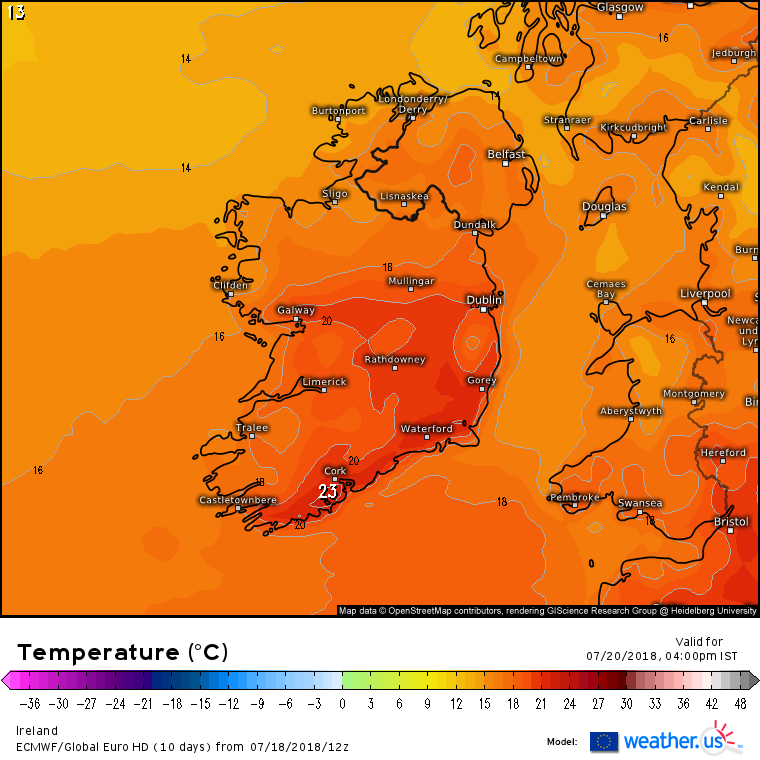 23c and 26c in Cork on Saturday and Sunday respectively on the ECM 12z. ECM showing best temps in the S and SE in the coming days with Pressure highest in the S. Probably a big contrast between N and S over the weekend. The South on the edge of the HP over the Weekend. 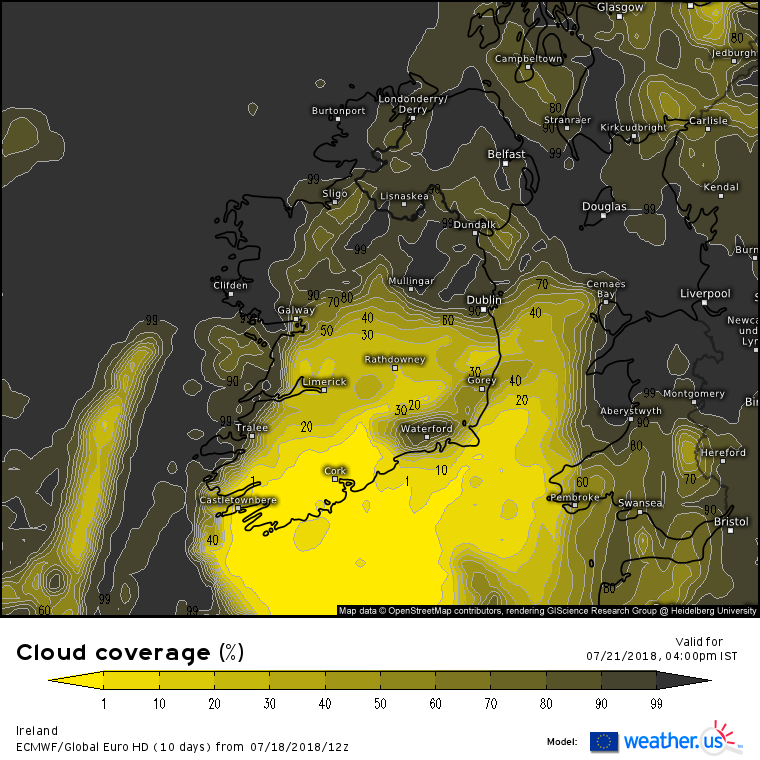 Hopefully cloud won't block too much sun further up the country over the weekend. 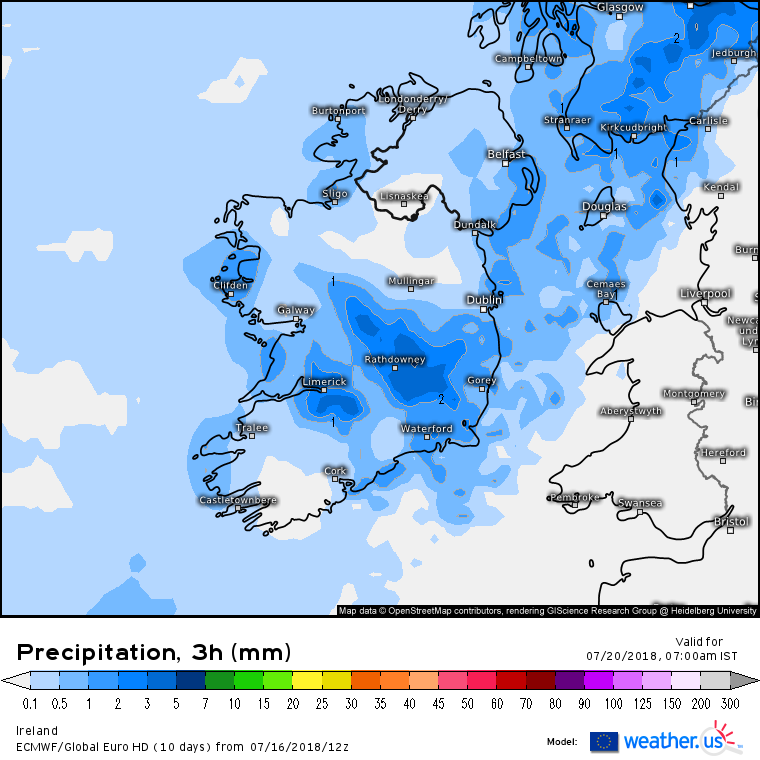 Light rain / drizzle possible in Northern counties Sat night/ Sun morning. 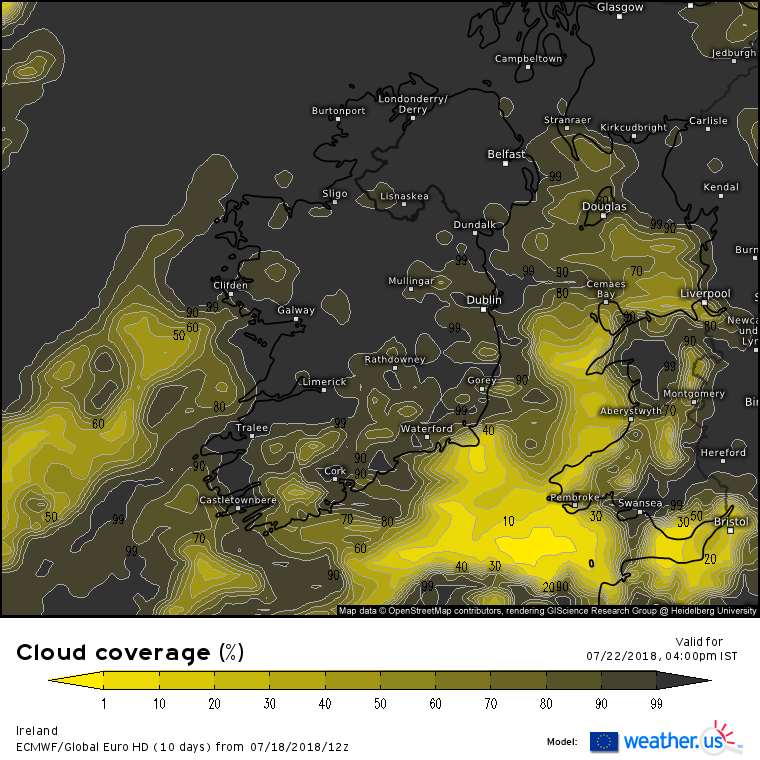 A weak dissipating front looks set to cross the country on Mon. Rainfall amounts low. 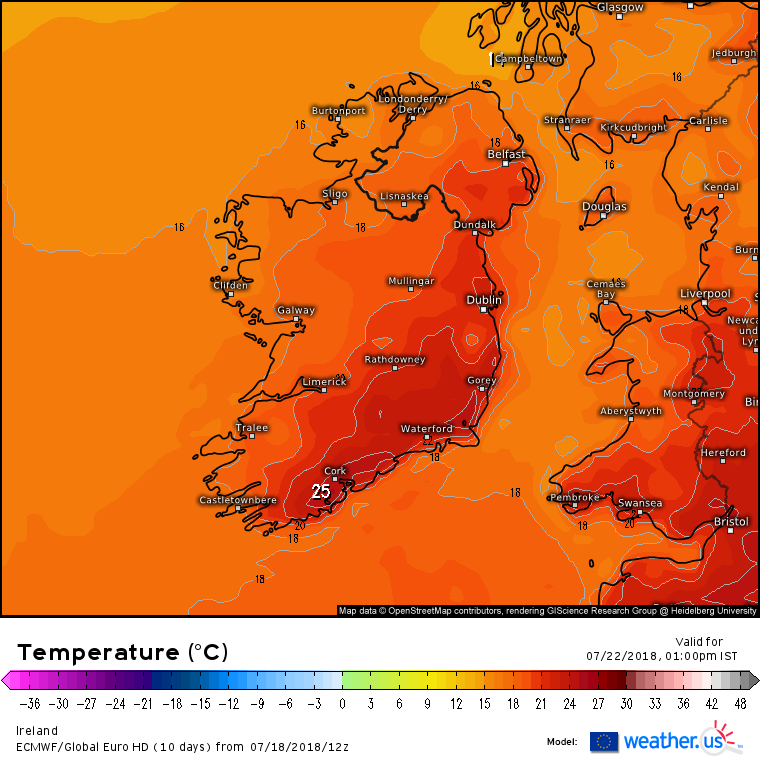 Humid and muggy at times . 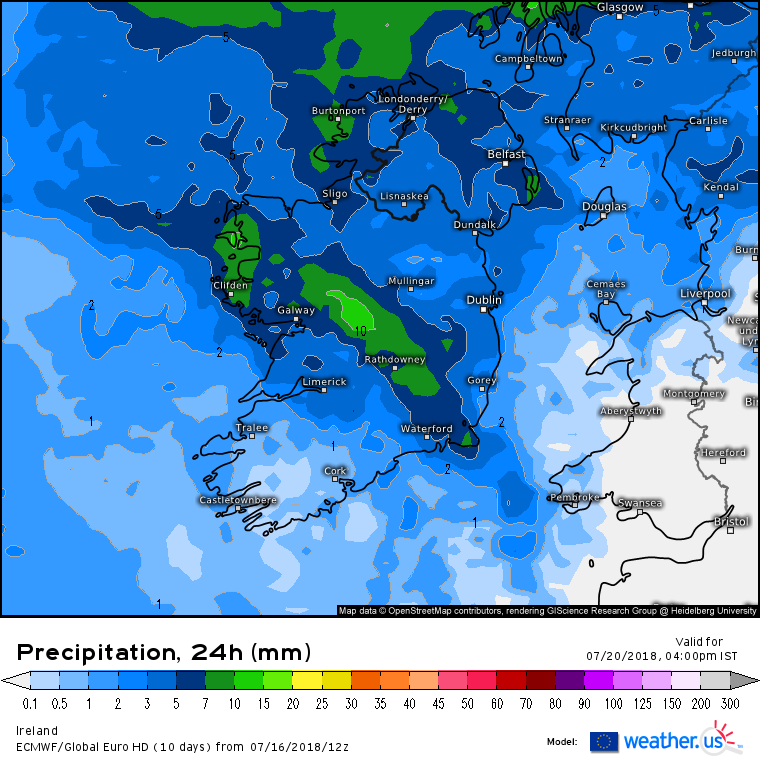 Rain moving down from the NW to SE early Fri ,becoming lighter on its way. 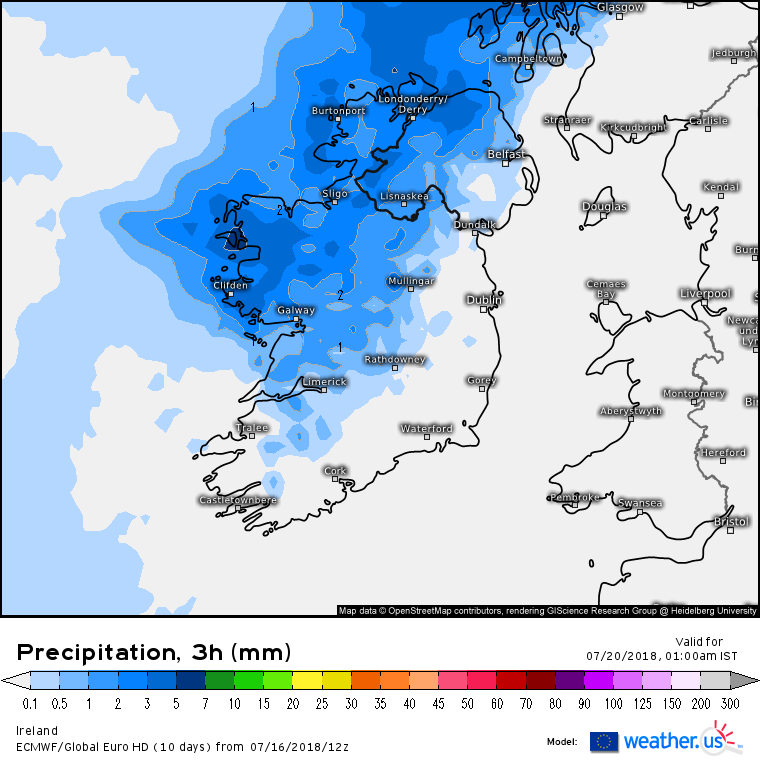 Amounts in general quite low apart from the NW/ N region. 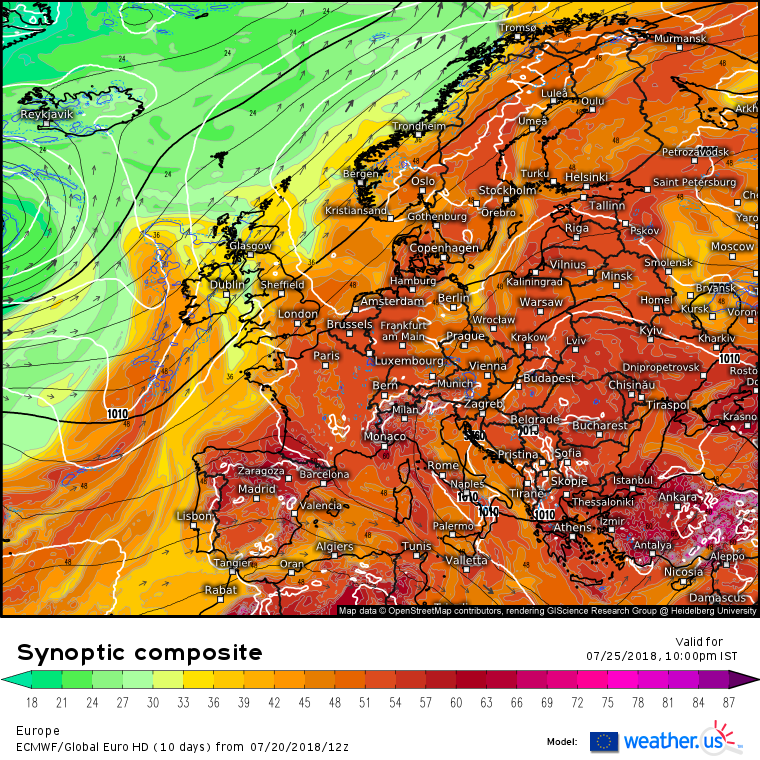 A noteworthy possible spell of rain for next Weds, which at present looks substantial, just at the edge of +120 hrs so a fair degree of uncertainty yet. 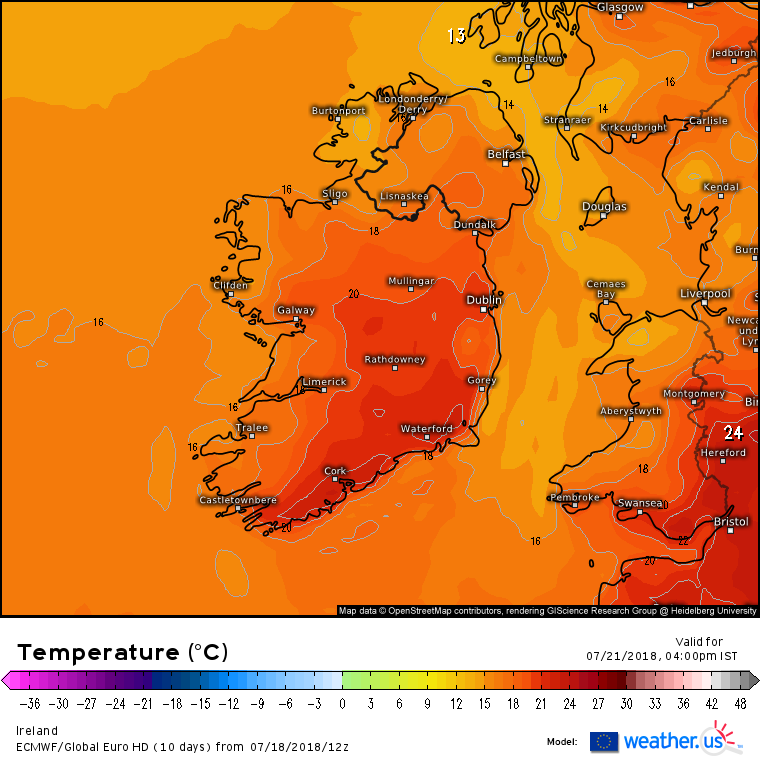 A chance to get a decent fall of rain perhaps. 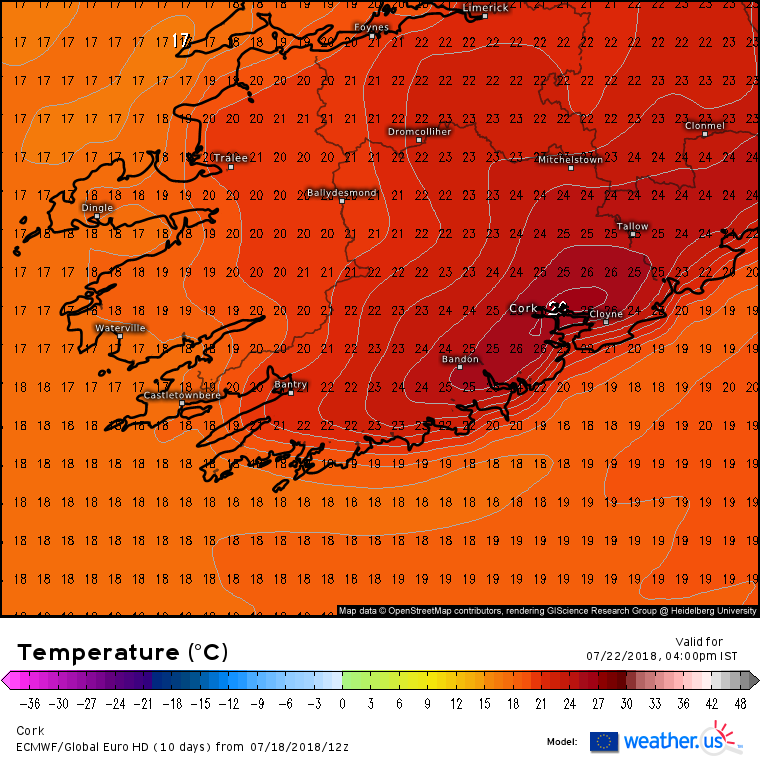 Breezy along Atlantic Coasts. 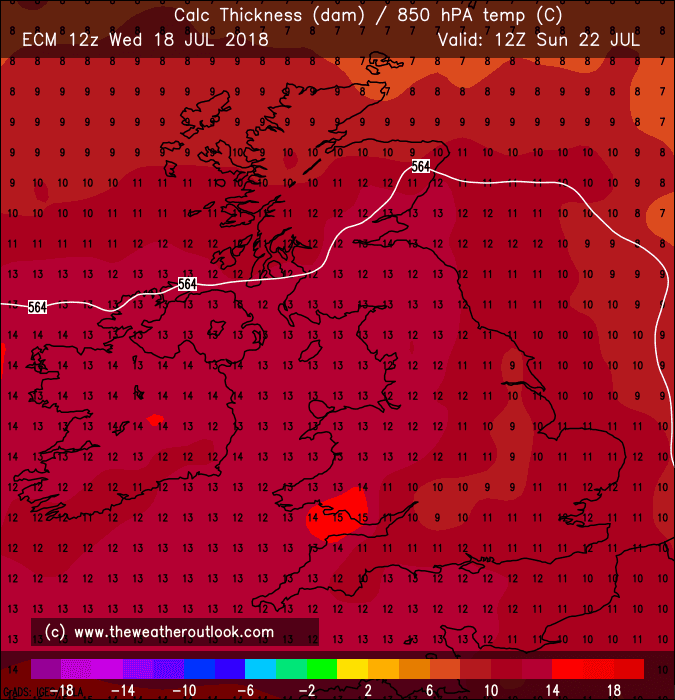 A noteworthy possible spell of rain for next Weds, which at present looks substantial, just at the edge of +120 hrs so a fair degree of uncertainty yet. 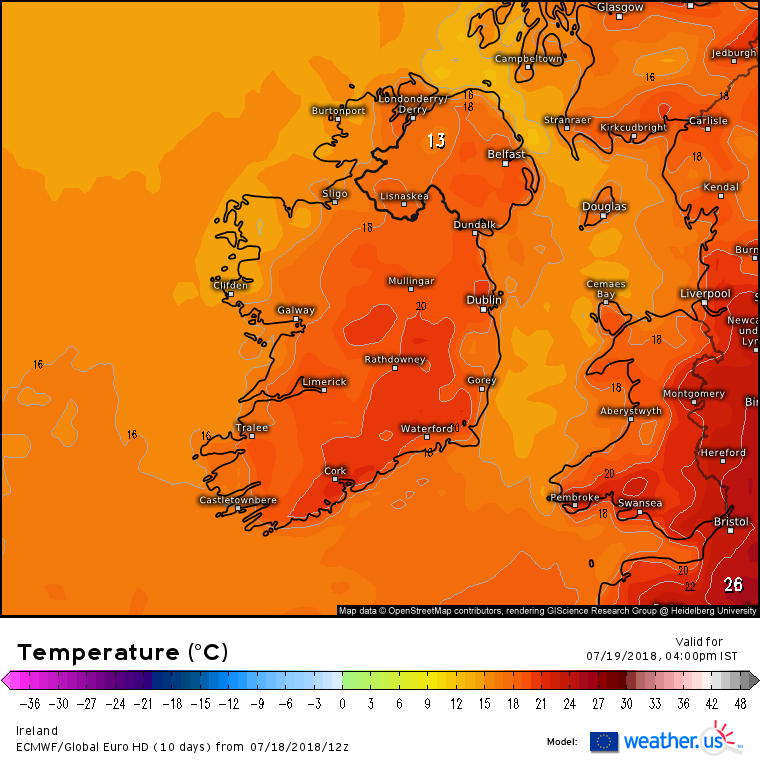 A chance to get a decent fall of rain perhaps. 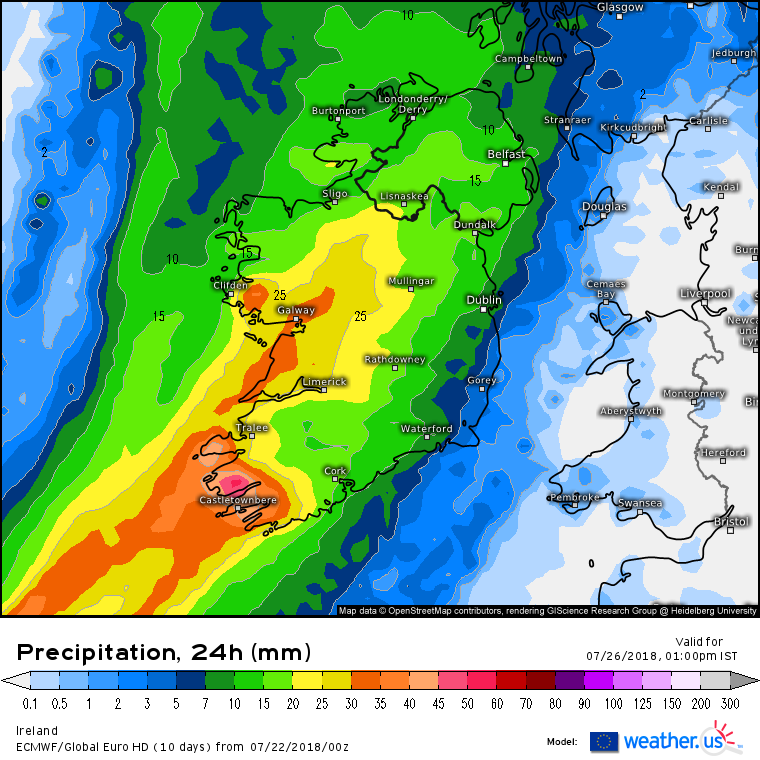 Wednesday's rain band on the hi res models. WRF-NMM barely has 1mm for most places. 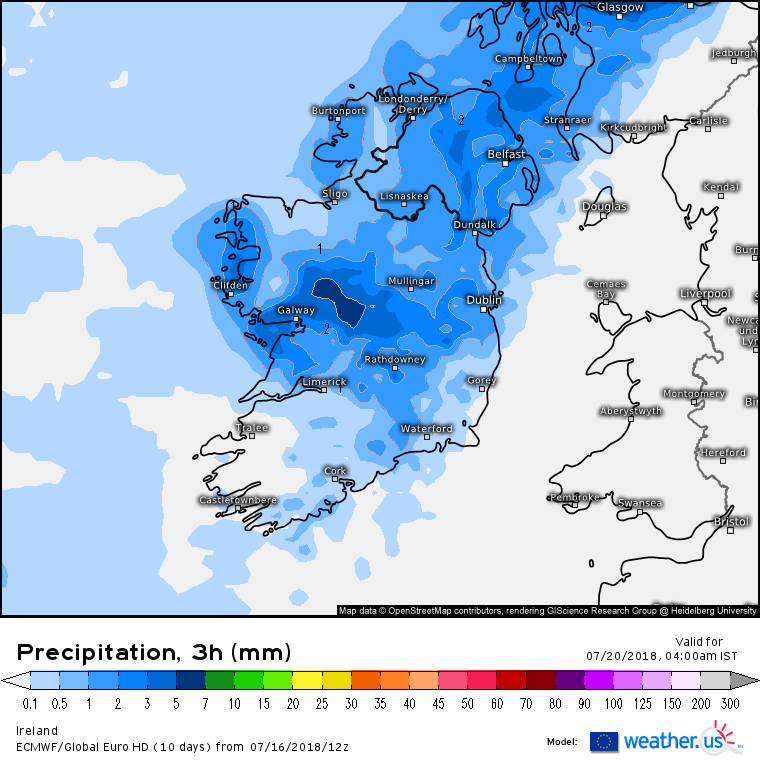 Arpege shows it relatively heavier (keep in mind, this is rain averaged over 6 hours) with a little "ripple" on the front pushing up from the south Wednesday night into early Thursday. All depends on the track of the messy frontal system determining what rainfall totals we get Weds /Thurs. 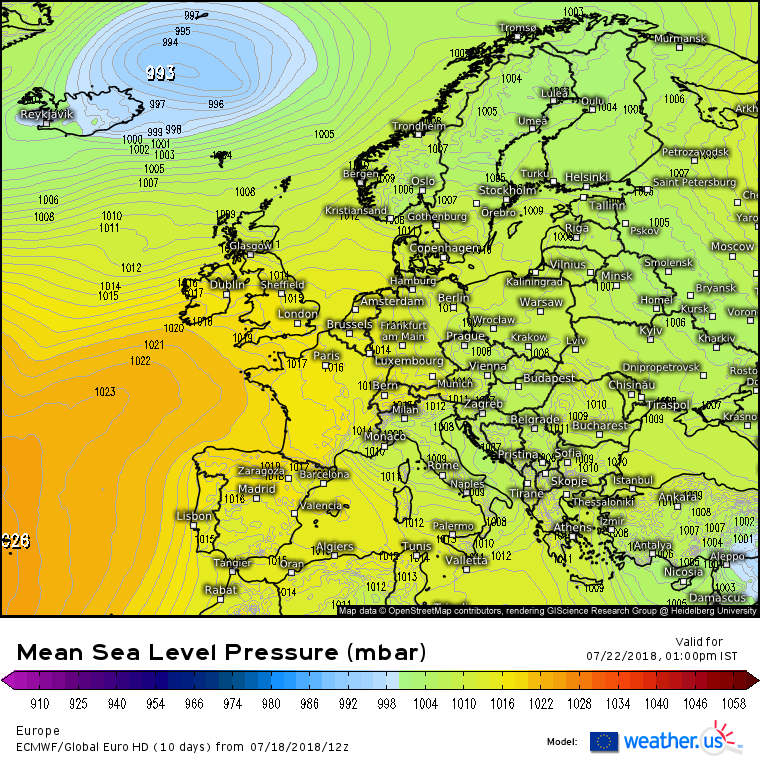 Potential there for decent amounts and ECM leading the way in that respect. The American models keeping the track further W. HARMONIE showing SW, S and W probably getting the most but not showing as much as the ECM I would think.